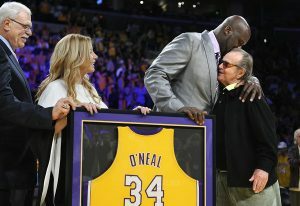 JEANIE BUSS – Entering her first season as President after 14 seasons as Executive Vice President of Business Operations, Jeanie Buss is now responsible for running all aspects of the Los Angeles Lakers organization. Buss, who will continue to lead all Lakers business operations, which include managing team marketing and sponsorships as well as relationships with broadcast partners, will also oversee the team’s basketball operations, working closely with Executive Vice President of Basketball Operations Jim Buss and General Manager Mitch Kupchak. PHIL JACKSON – Does he really need an introduction? In 11 seasons as Head Coach of the Los Angeles Lakers, Phil Jackson’s results after coming west were nothing short of amazing. In his first three seasons, Jackson led the Lakers to three consecutive NBA Championships (2000-02) for the first time in franchise history (Los Angeles era). First with the Chicago Bulls (1991-1993 and 1996-98) and then with Los Angeles (2000-02, 2009-10), Jackson won an NBA Championship (11 times) more than half of the time he spent as a head coach (20 years) and visited the NBA Finals (13 times) even more often.